Edited by Kiumars Ghowsi . Electrophoresis experiment was first carried out by Tiselius in 1930. In his thesis titled, “The Moving Boundary Method to Study the Electrophoresis of Proteins“, Tiselius utilized the electric charge carried by the macromolecules to achieve some pioneering separation of blood plasma proteins in free solution on a photographic film. Electrophoresis is defined as the transport of electrically charged particles in a direct current electric field. Electrophoretic separation is based on differential rates of migration in the bulk of the liquid phase and is not concerned with reactions occurring at the electrodes. In the early days, electrophoresis was carried out either in free solution or in the supporting media such as paper, cellulose acetate, starch, agarose, and polyacry lamide gel. In between 1950 to 1970, an enumeration of techniques and instrumentation for Electrophoresis were developed. Gel electrophoresis has been rarely used for the separation and identification of small charged molecules of molecular weight less than about 1000 Dalton. 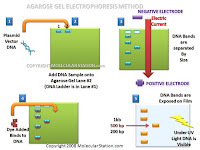 In addition, the major draw back of gel electrophoresis is lack of complete automation. To overcome the low efficiency and reduce thermal effects, Hjerten carried out electrophoresis in narrow diameter tubes of 300 μm internal diameter the first time in 1967. This was the birth of open tubular capillary electrophoresis. However, in the following decade, capillary electrophoresis did not draw enough attention from researchers. Only until 1981 when Jorgenson and Lukacs demonstrated the use of narrow capillaries to produce high efficiency for the separation of dansy and fluorescamine derivatives of amino acids, dipeptides and simple amines, high performance capillary electrophoresis was born and a new era of capillary electrophoresis has begun. After the introduction of commercial CE instrument in late 1988 that allowed the full automation of CE analysis to be possible, more and more research publications and industrial applications have made capillary electrophoresis one of the dominant technologies in the separation field. In 1985 Terabe et. al added a new dimension to capillary electrophoresis. They added micelles to the aqueous electrolyte and were able to separate neutral molecules such as benzene and phenol. Using this technique it is possible to separate various drugs which are neutral or even charged. One that can separate enantiomers using this technique is called micellar electrokinetic capillary chromatography (MECC). The present book contains few fundamentals on capillary electrophoresis and diverse application of electrophoresis in general. We hope this collection will entertain the readers who are interested in fundamental as well as applications of electrophoresis in general.